January can be a dreary time of year, making rituals like a cup of hot tea all the more important. For a special treat, sweeten your cup against the bitter cold winter with lemony-herbal simple syrup. It’s especially good in a light, flowery tea such as white peony. Simple syrup is a classic liquid sweetener that is employed to more effectively and precisely sweeten iced beverages that tend to prevent granulated sugar from dissolving fully. A simple syrup infused with lemon balm leaves is a lovely way to flavor and sweeten beverages — both when you want to avoid using lemon juice and when you want to intensify its lemony flavor. Lemon balm herb (also called melissa) has a fine lemon-like flavor that is both suave and intense. Get the recipe for lemon balm-infused simple syrup here. This lemon balm-infused simple syrup brings lemony sweetness to hot and iced tea. 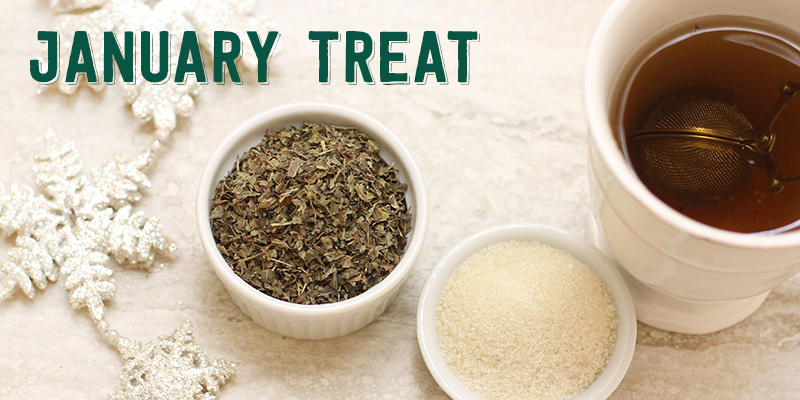 The herbal tones of the lemon balm infusion enhance the savor of the tea leaves in a less obtrusive manner than lemon, which can tend to clash with and overpower the subtleties of fine tea. Stir about 1 teaspoon of lemon balm simple syrup into each cup of brewed tea. This simple syrup can also be used to sweeten cocktails and to create a simple lemon balm soda — just stir 1 tablespoon into 8 ounces of club soda, adjusting to your preferred sweetness. What is your favorite January treat?